In selecting a tree, make sure the “handle” at the bottom is long enough to allow the trunk to fit into your tree stand. Otherwise, it will be necessary to remove large branches near the base, which could ruin its appearance, shape and visual balance. 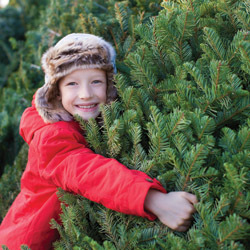 Check the tree’s freshness before your purchase by bending, pinching or flexing needles. They should be somewhat pliable and not fall off easily. Avoid purchasing a tree that is already showing signs of dryness. 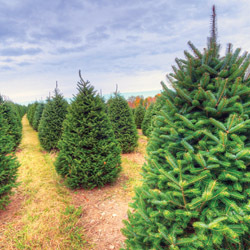 Make a fresh cut to remove 1/4″ to 1″ of wood from the base of the trunk before putting the tree in the stand. If you use a “center pin” stand, make sure the hole is drilled in the stem after the tree is trimmed. Once home, place the tree in water as soon as possible within 6-8 hours after cutting the trunk. This will help the tree better absorb moisture to keep the needles plump and secure. If needed, trees can be temporarily stored for several days in a cool location, such as a garage, before being taken indoors and decorated. Place the freshly cut trunk in a bucket full of water. The tree may need to be supported to keep it from tipping over. To display the trees indoors, use a stand with an adequate water holding capacity for the tree. As a general rule, stands should provide 1 quart of water per inch of stem diameter. Use a stand that fits your tree. Some stands have circular rings at the top, so the ring must be large enough for the trunk to fit through the hole. Other stands are open, which may allow a greater range in trunk size. Avoid whittling the sides of the trunk down to fit a stand. The outer layers of wood are the most efficient in taking up water and should not be removed. Keep your tree away from sources of heat such as fireplaces, heaters, heating vents and direct sunlight, all of which can make it dry out more quickly. Lowering the room temperature will slow the drying process, resulting in less water consumption each day. Check the stand daily to make sure that the level of water does not go below the base of the tree. With many stands, there can still be water in the stand even though the base of the tree is no longer submerged an unable to absorb water. Apply Wilt-Pruf, an anti-transpirant, to branches to help prevent moisture loss and needle drop. This should be done as quickly as possible before decorating the tree. Do not use additives in the water, including floral preservatives, commercial tree preservatives, molasses, sugar, bleach, soft drinks, aspirin, honey, etc. Clean water is all that is needed to maintain the tree’s freshness. Miniature lights, particularly LEDs and other energy-efficient bulbs, will produce much less heat and reduce drying of the tree. Do not overload the tree with too many lights. Always inspect light sets prior to placing them on the tree. If worn, replace with a new set. And, do not overload electrical circuits, fuses or circuit breakers. Always turn off the lights when leaving the house or when going to bed. Minimize how long the lights are on, such as not leaving the lights on during the day when they are less visible. Monitor the tree for freshness by bending or pinching needles to test their flexibility. After Christmas or if the tree is dry and brittle, remove it from the house. With just a few common sense steps, you can find a lovely fresh cut tree and keep it beautiful throughout the holiday season.